Seattle is hands down an awesome food and beverage city and an absolute a paradise for vegans, vegetarians, gluten frees, organics and plain old gluttons!! We ate ourselves to oblivion and loved every bite! So on our first night we headed down to the Seattle Market to take in the sights, sounds and sniffs…man that place in itself is a gastric adventure! We decided to save the market food for another day and headed to Tom Douglas’ Etta’s http://tomdouglas.com/index.php?page=ettas . Etta’s looks onto the bustle and hustle of the market and the ingredients fresh and local and prepared in a way that highlights the food and flavours. 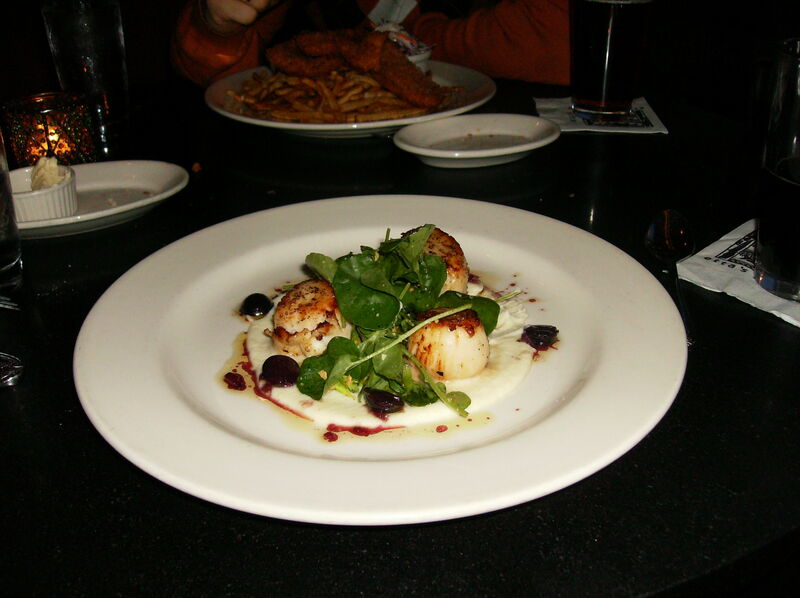 I had scallops and to this day I can recall the taste and texture, smooth as butter and delicately creamy…ahhhh! Darek had fish and chips which was expertly breaded and full of flavour. We also indulged in locally brewed beer (sadly the only one I had on the trip as I paid for that gluten indiscretion dearly- worth it though!!). 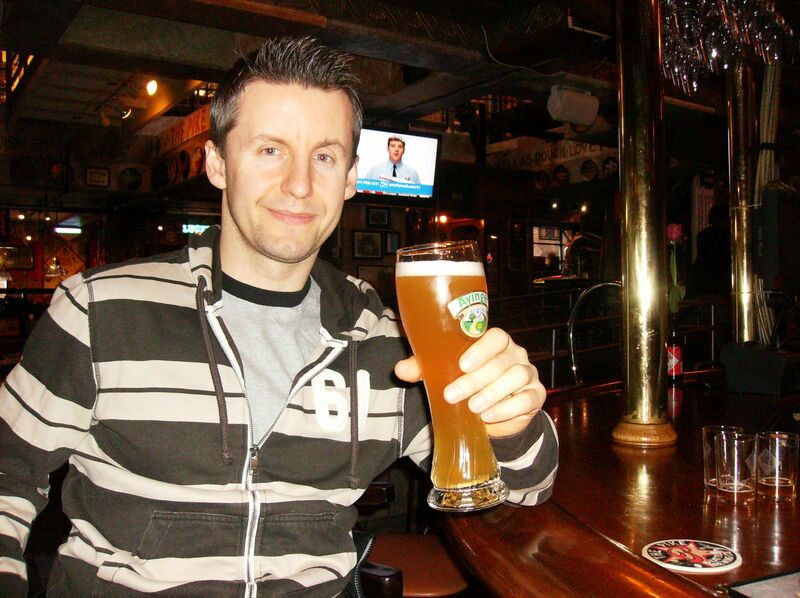 In fact Darek spent the week going from brew to brew, Seattle is host to a number of local and organic micro breweries, most also do a mean cider of which I indulged happily. We had a great afternoon in the Pyramid http://www.pyramidbrew.com/alehouses/seattle and we spent an evening in the Pike http://www.pikebrewing.com/ of course our days were packed full walking all over the city so by the time we headed back to the hotel we were thirsty again and had to taste the many fine wines of the region so grabbed a bottle for the local off sales and headed back to our room for some rejuvenation. http://www.winesnw.com/puget2.html We drank white all week and found the majority crisp and pure, we were able to pick up many organic bottles http://www.seattledining.com/wine/tastings/index.asp So enjoy exploring Washington state’s contribution to the world of wine! When we weren’t sampling the alcoholic delights of the city, we were indulging our morning appetite for caffeine. Seattle is not just a coffee city, it is a cafe city, and this meant we started every morning with a piping hot concoction and a newspaper…now that my friend’s is a holiday! Darek stuck with tea but I ventured into all sorts of lattes, espressos, cappuccinos and hot chocolates! We spent hours in the various cafes of Seattle delving into the politics of day, the rain in the Olympics and freedom found in a cup of something hot and steamy! So when you go to Seattle, just walk and find the first place that looks comforting, I assure the java will be good and there will be plenty of papers to fill your morning with! 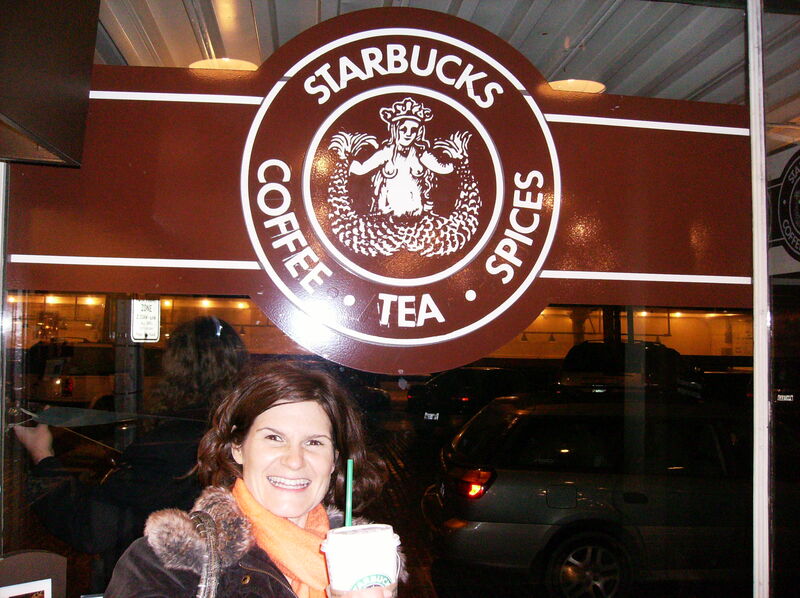 Now my biggest excitement was visiting the original Starbuck’s! I was so excited I could barely order my grande earl grey tea misto half sweet sugar free vanilla with soy…after a number of photo ops and drink in hand I was on cloud 9, I had been on a pilgrimage to the siren that had changed the face of coffee and tea forever! Since we love a good adventure we decided on morning we would spend the day eating our way through the market, armed with stretchy pants and a desire for culinary diversity we headed out. http://www.pikeplacemarket.org/ First stop was the market juice bar. Real apples, carrots and beets juiced before your eyes with no preservatives, sugar or junk as this may be the only nutrients we would consume during the day we sucked back our juice greedily and set out in search o treasure. We ended up at Fran’s Chocolates just outside the market, where we ate gold leaf covered chocolates and salted (we tried grey and smoked) caramels- suffice to say I found heaven at Fran’s. http://www.franschocolates.com/store/home.php . Then on to the market were free samples abound, yes fishmongers, pasta makers and chocolateirs all enticing unsuspecting tourists with their “too tasty to leave behind” wares. We stopped at Beechers handmade cheese to watch the cheese being made and got some cheese curds for snacking. We of course had to drop by Piroshky-Piroshky, which quickly became Darek’s favourite breakfast, lunch and snack place! 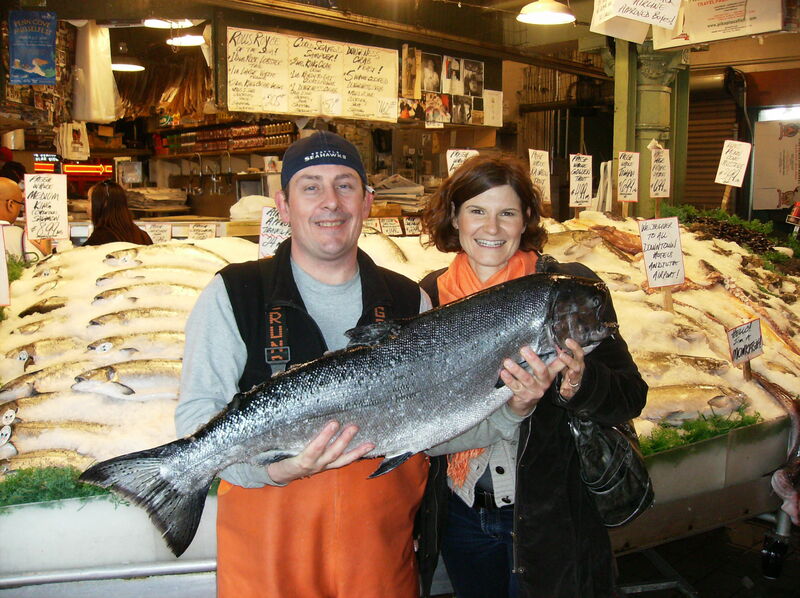 When it came time to get some smoked salmon into our bellies we actually looked at a number of shops other than the famous Pike Place Fish Market (yes from the FISH video) and true to their word, they were the most customer oriented, engaging group of fishmongers in the market. We happily paid a higher price for our fish to feel valued and respected; it was a great customer experience and by the way, the fish was amazing! http://www.pikeplacefish.com/ It was then on to European drinking chocolate, cheesecake and chocolate covered cherries at which point we went into diabetic coma. Honestly, take a day and graze your way through the food at the market, it is an eclectic journey that your taste buds will forever remember!